To that end, I have a standard slide deck that I have used and updated every quarter or so, at least for the past couple of years. In that time, conditions have been consistently favorable. By keeping the focus on what mattered—coupled with the fact that the signals that mattered were very positive and well outside the trouble zone—I could keep drawing the same conclusion over and over again. Namely, that despite the headlines and the worries, things would be fine. And that worked out well . . . until recently. Since conditions have changed, I am working on the third update of the deck this year. I now have to start talking about how conditions have deteriorated and the risks have risen. I am no longer as certain that everything will be fine for years to come, although there is still a significant probability that will be the case. For the first time in years, I am faced with how to speak to clients about pending risks, informing them without unduly alarming them. I have to admit, I am somewhat out of practice. A good place to start is with the economy. Current conditions are good, and it is important to lead with that. Job growth continues to be strong, confidence is still high, and the Fed (despite the brief inversion of the yield curve at the end of last month) is still providing monetary policy support to the economy. These factors should carry us through at least the next couple of quarters. No need to panic here. At the same time, we do need to start looking at what might happen after the next couple of quarters. Here, the warning signs are clear. Confidence looks fragile and is vulnerable to external events like another government shutdown. The yield curve isn’t inverted, but it is quite flat. Spending and investment are softening. Corporate earnings are expected to drop this quarter before rebounding, but that rebound is by no means ensured. The risks are real, if not immediate, and seem to be rising. The same story is true for the market. At the start of the quarter, the stock market was as cheap as it has been for the past five years on a forward P/E basis. Now, it is back up at the top of the range and quite vulnerable to changes in earnings expectations. Similarly, high valuations depend on high consumer confidence, which may be vulnerable. Again, the risk here is likely not immediate but is certainly real. When I speak, I want to give clients what they need to know in as simple a story as possible. For the past several years, that story has been that everything is fine and was very likely to stay that way. Now, the story has changed to everything is fine but may well deteriorate within a year or two. That is a big difference in theme and tone. It is not, however, a big difference in what their strategy should be, which is the final and, in many ways, most important piece of the story. 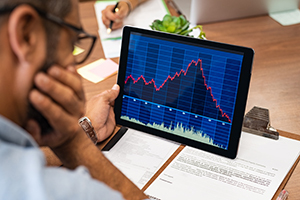 Advisors and investors should know and plan for economic and market downturns. Portfolios should be designed for tough times because they will certainly come around at some point. And that is the “new” story: that tough times are likely to come, and reasonably soon, but that there is still no need to worry. A properly designed portfolio, in line with investors’ risk tolerance, will allow them to meet their goals despite any short-term turbulence. We need to know turbulence is coming, which is what the new story will say, but we also need to know this volatility is normal. Come to think of it? Maybe the new story is not that different after all.